How do I update my Structure Sensor's firmware? Just open the Structure app, and click on the gear icon in the lower right-hand corner of the screen. If a firmware update is available, you'll see a message that lets you know. 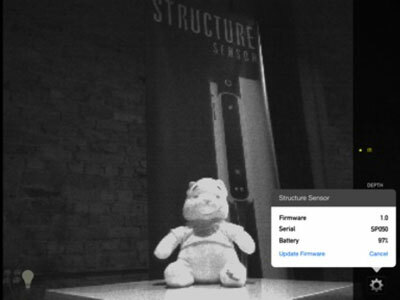 Click on the "update firmware" button, and your Structure Sensor will automatically begin and complete the firmware update process.